Patch-eye view: NASA techs look into space shuttle Endeavour's crew cabin after storing patches and a photo on board for the orbiter’s final ferry flight. The space shuttle Endeavour's hatch will be opened by NASA technicians one last time this week, in part to retrieve thousands of souvenir patches and a photo — the retired orbiter's final flown cargo. Endeavour, which is now temporarily parked in a United Airlines hangar at Los Angeles International Airport (LAX), is being prepared for its delivery to the California Science Center (CSC) for display. The shuttle, piggybacking atop a NASA jumbo jet, landed at LAX on Friday (Sept. 21) after a three-day cross-country ferry flight and four-hour flyover of the Golden State. 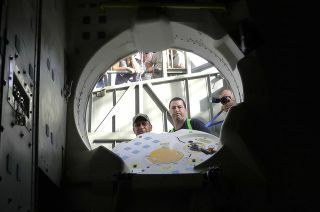 Just a few days before Endeavour left NASA's Kennedy Space Center in Florida for the final time, the space agency fulfilled a request by the CSC and stowed a care package on the shuttle's mid-deck inside its crew compartment. Stored in a locker, the pouch was flown with the orbiter on its recent ferry flight, which marked the last time a space shuttle ever took to the air. Endeavour's final cargo, carried on what the CSC dubbed "Mission 26: The Big Endeavour," may be more memento than mission-critical, but it still served a purpose: to say thank you. The California Science Center flew 5,000 woven patches aboard Endeavour featuring a design that celebrated both of the modes of transport responsible for delivering the shuttle to its new display pavilion. The 4.5-inch wide (11.4 centimeters) colorful badges depict Endeavour soaring on top of NASA's modified Boeing 747 Shuttle Carrier Aircraft (SCA) and riding the self-propelled overland transporter that will take it on its road trip to the CSC. Endeavour is set to depart LAX and travel through Inglewood and Los Angeles city streets on Oct. 12-13 as the final leg of "Mission 26." The numbers "25:123:12" are inscribed along the top of the patches. The "25" is for Endeavour's 25 missions to space and the "123" represents the 123 million miles (198 million kilometers) the orbiter traveled in flight. The "12" refers to the number of miles the shuttle will travel on the road to the science center. While black-bordered versions of the patches are already for sale in the CSC's gift shop, the flown patches — which are set apart by their gold thread border — will not be sold. Instead, say science center officials, they will be given to those who made "Mission 26" possible: team members who worked on the ferry flight and the upcoming overland transport, as well as the center's donors who helped fund Endeavour's temporary and permanent exhibits. Since last year, the CSC has invited its supporters to join Team Endeavour as part of its "EndeavourLA" campaign. Donors could (and still can) choose to sponsor one of the more than 23,000 heat shield tiles that cover the shuttle's underbelly and upper surfaces. For donations of $1,000 or more, supporters receive a "limited edition Endeavour gift" — the ferry-flight-flown patch. The CSC has said it has already raised close to half of the $200 million it needs to transport and display Endeavour. A significant portion came from just a single benefactor, who was represented aboard Endeavour's final ferry flight, too. When Endeavour rolls up to the California Science Center on Oct. 13, it will enter a display pavilion named for the late Samuel Oschin. Oschin's widow Lynda requested CSC fly a photo of her husband aboard Endeavour for its flight to Los Angeles. The photo, which depicts both Samuel and Lynda, flew inside the same pouch as the patches. Oschin and his wife had set up a family foundation to support causes related to astronomy, the arts, medicine, advocacy and education. After her husband died, Lynda made a "transformational gift" toward bringing Endeavour to the California Science Center. "This is my husband's dream, his vision and his passion, everything he loved and believed in, rolled into one," Lynda Oschin said at LAX on Friday after the shuttle and SCA taxied to a stop. "One day, a child will walk into the new 20-story Samuel Oschin Air and Space Center," she continued. "That child will look up in sheer, utter amazement when he sees the Endeavour in the launch position, and that child will be so inspired to lead the way for the future of the United States and for the future of our world." The Oschin Air and Space Center is expected to be ready by 2017. Until then, the shuttle will be held in the Samuel Oschin Space Shuttle Endeavour Display Pavilion, which the CSC plans to open to the public on Oct. 30. Visit collectSPACE to see a sample patch of the type that was flown on space shuttle Endeavour during its final ferry flight to Los Angeles, Calif.